We use mainly these three models of small linear diaphragm pumps and cheap pond pumps so please take the time to understand the limitations and benefits of each one. If you have any questions or need help we will be glad to assist you! Understanding the concept of building the perfect aeration system means having a basic understanding of the various air pumps, blowers and compressors that are available. The compressor or pump you choose will require some understanding and knowledge as to what you need the pump to do. 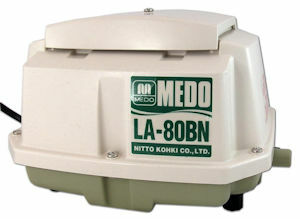 Every pond diffuser, every length of airline, and every airstone connected to your compressor will require a specific CFM (cubic feet per minute) of airflow as well as a required PSI (pounds per square inch) to overcome the head-loss and internal friction of every foot of tubing and the specific resistance inherent in the diffuser system being used. One important factor in choosing a silent linear air pump or diaphragm pump is to understand that it requires 1 PSI to push air bubbles to a depth of 28" or 2.3 feet deep. So if your pond averages 6 feet deep then before you even consider the number of diffusers or thetype of diffusers to be used you have to ensure your electric linear air compressor can deliver at least 2.6 PSI. But be careful because each diffuser, whether it is a diffuser disc, an airstone or some sort of homemade diffuser that you want to hook up to your cheap pump, all of them will have a certain resitance that will add pressure requirements to your formula. A single membrane disc diffuser for example can add an extra 12 inches of virtual depth (this means that every disc in your aeration system will demand an extra 0.42 PSI on your compressor) while a high-efficiency glass-bonded diffuser only have a registered air resistance of less than 0.25 PSI. If you are considering one of these compressors then you likely are not running long lengths of tubing...most of these low pressure systems can pump air through standrad 3/8" and 5/8" for small distances from 50 or 200 feet depending on the compressor. It is only when you need a compressor to push air through several hundred feet of airline you need to cinsider the line loss calulation of airline which is the amount of pressure and friction that builds up against the walls of the tubing and the associated loss of pressure. This means that in a length of 200 feet of tubing you might require an extra 2 PSI to overcome the air volume friction based on the inner diameter of the tubing. With a higher PSI output and much lower watts than any pond pump or compressor on the market these cheap air compressors have become our favorites when the pressure requirements are beyond the WhiteH20 models listed above. With the smart and efficient motors in these UL-Listed and CE-Approved pumps, pond aeration systems just keep getting easier and any home-made do-it-yourself aeration system will be trouble-free with with these long-lasting and powerful linear air pumps. The linear air pumps used by ThePondReport.com average about 40% more airflow and about 20% lower 110/115 V power consumption than similar models. 230V is also available for the same price. Specify your power needs by email when ordering. You will see similar looking air pumps imported from Asia like pumps from China or Tiawan Made pumps but the SweetH20® brand is significantly different and while we don't want to insult any manufacturer...these pumps are the best available!. These are designed for 60-Hz (North American) operation to produce maximum efficiency. These linear compressors model permit continuous operation exceeding 3 years in normal continuous usage. The only maintenance required is minimal: Simply clean the air inlet filter as needed with a few sharp breaths, a vacuum passage or according to the included instrcution manual. As with all of our oiless pond aeration air pumps there is no need for lubrication, and the included outlet air is always clean. Besides being ultra-efficient they are also super-quiet. These units are often found in University classrooms, pet store or laboratory or anywhere, including the pond, where clean efficient pumps are a must! 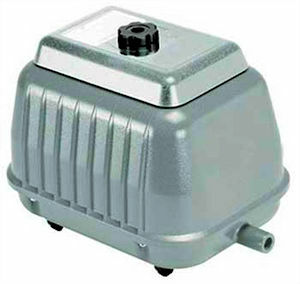 Each long-lasting pump uses a heavy, cast-aluminum, drip proof housing. Standard models are 115V/60 Hz with 6' power cords. UL-listed and CE-approved. Three-year warranty (does not include filters or diaphragm). Available in 230 V and 50 Hz by special order only. To maximize the life of these linear compressors it is best to keep the unit in a shed or build a small structure like a doghouse to hold it from the elements. By operating your pump within the correct pressure range (we like to stay about 25% less than the maximum PSI rating of the model) you will greatly reduce the need for changing diaphragms, heads or valves. Purchasing a repair kit, despite your best installation intentions, is not a bad idea. If all parameters of the pumps are respected you may need to change the diapghrams once every 24 to 48 months but it's easier to have one on hand in your tool-shed instead of buying your repair kit online after a break-down as often fish don't take a fancy to being a week without air! Because these pumps have an available repair kit they are our highest reviewed pond aeration pump. These are not linear "diaphragm," but true linear "piston" type pumps. Since the only moving part—the piston—floats on a bed of air, a exceptionally long service life can be expectedThese are not linear "diaphragm," but true linear "piston" type pumps. Since the only moving part—the piston—floats on a bed of air, a exceptionally long service life can be expected (8 years of continuous life is not uncommon). You will experience exceptionally quiet, energy-efficient operation and clean, oil-free air. An outdoor-rated housing, a grounded power cord, 3/4" hose barb and 115V/60 Hz are all standard. UL-listed. One-year warranty. The pump's unique and simple structure has no complicated transmission mechanism such as a crankshaft, connecting rods, ball bearings, etc., which are widely used in between the motor and compressor in conventional pumps. The activated electro-magnet attracts the piston against the return spring, while air is taken into the cylinder through the opened inlet valve. When the electro-magnet is deactivated, the return spring pushes the piston back, and the compressed air is brought out of the cylinder through the now open outlet valve. The system can function as either an air compressor or as a vacuum pump. Replacement of the piston is easily achieved by simply removing the end cap connected to the pump housing by unscrewing the four screws which hold the cap in place. Completely oil free construction is achieved by the combination of smooth Teflon® seals with superior resistance against abrasion on sliding piston surfaces and the "air bearing effect" created by the unique air path design. Self-cooling design Cool intake air is blown onto the electro-magnetic coils through an orifice, making sealed construction possible and preventing the escape of operating noise. Low noise level The machine has no complex transmission system. This results in the lowest noise level possible due to the absence of rotating parts or ball bearings. Operating noise is also quelled due to the pump's sealed configuration. Small output air pulsation Piston reciprocation is synchronised with input power frequency regardless of load (i.e. ; 3000 rpm for 50Hz and 3600 rpm for 60Hz). Such high RPM adversely reduces each discharge volume and eliminates any problems caused by pulsation. Low Power Consumption The piston is the only component in the system which moves. The absence of transmission usage to pass the power to the piston means that there is a large reduction in energy loss, and an improvement in efficiency over other pumps. Compact composite structure This unique system enables direct reciprocation of a single part which consists of composite piston and armature. The incredibly compact and lightweight design was achieved by combining what are two different functions in other pumps - motor and piston - into a single structure. Anti-overpressure mechanism When the output pressure exceeds the rated value the piston stroke will automatically diminish and prevent over-pressurising. At the same time, the current and power consumption will also be automatically reduced, thus eliminating possible failure caused by tentative overload. Low vibration The aluminium die-cast piston produces very little vibration or kick-backs. Little or no damage from vibration stress is therefore sustained during operation. Even secondary vibrations are absorbed by special soft rubber feet. Quick Response Due to the lower starting current, the unit can immediately respond to frequent on-off input signals, even under back pressure conditions. These tough air compressors can feed 1 to 5 pond diffusers or airstones (according to CFM requirements) in a pond up to 8 feet deep. Best longevity is delivered when operating pressure is between 2.2 and 3.5 PSI ...see the operating curve chart below to design your homemade aeration system using these pumps or send us an email with questions. 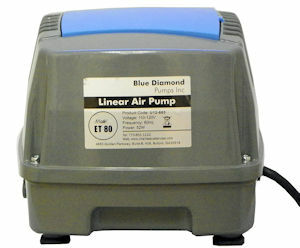 Run one or more diffusers or airstones with these pumps! I have so many clients ask where to get a long lasting air pump to run a few diffusers and have found a good line of imported, outdoor rated air pumps and I finally found a line that I think outperforms many models that I have reviewed. These are sturdy, very reliable, and quiet air pumps that will provide a long service life and they have a two-year warranty which isn't bade because I've tried many diaphragm pumps that seem to need a diaphragm repair kit every 6 months! Built for outdoor use, keep it protected to prolong the average life-expectancy. You don't need anything fancy; just build a small box, preferably with ventilation (small fan) to keep your pump out of the snow, rain and away from the gnawing teeth of muskrats, beavers or other pond creatures. They are designed for outdoor use but why not protect your investment? Most pumps deliver a more-than-modest output from 1.8 to 7.9 cfm (50 to 223 lpm) of oil-free air with a maximum pressure of 4 psi. Remember that each 2.3 feet of water is 1 PSI so with a max dishcharge of 4PSI you can pump air to a maximum of 9 feet with the larger model...but this doesn't include resistance from the diffusers you are using or the friction loss from the tubing etc. Each pump has a 3/4" barb outlet and grounded power cord (5 ft). UL-listed. Two-year warranty. Use the specification curves of each model pump to determine how many diffusers can be used with each pump as each type of diffuser (silica bonded stone, membrane, pourous granite) will have varying resistance. The SECOH line of pumps is very popular in Europe but is now available in USA and Canada as well. The best price for a EL-60 is $275, the 80-17 is $325. Known to wear out wuickly if the max pressure reatings are surpassed the warranty is only one year. AL-15A -- $119.75 Power: 17W Output: 20 lpm (liters per minute) @ 1.4 psi - Typically good for at least 20-25 aquarium air outlets, variable depending on tank depth and the amount of air desired at each outlet. AL-40 -- $169.75 Power: 46W Output: 48 lpm @ 2.18 psi - Typically good for at least 50-60 aquarium air outlets, variable depending on tank depth and the amount of air desired at each outlet. AL-60 --$145.75 Power: 60W Output: 68 lpm @ 2.18 psi - Typically good for at least 65-75 aquarium air outlets, variable depending on tank depth and the amount of air desired at each outlet. AL-80 -- Buy it for $337.75 Power: 85W Output: 85 lpm @ 2.18 psi - Typically good for at least 80-95 aquarium air outlets, variable depending on tank depth and the amount of air desired at each outlet. The new style AL-80 takes the Al-80/120 repair kit. The new style pumps are apple green in color. The old style AL-80 takes the AL-60/80 repair kit. AL-120 Power: 124W Output: 130 lpm @ 2.9 psi - Typically good for at least 125-145 aquarium air outlets, variable depending on tank depth and the amount of air desired at each outlet. These repair/rebuild kits include all you need to restore or repair your Brookwood piston air compressor that is installed in the Vertex aeration systems. Please ensure you choose the correct kit for your model number. If you are unsure please contact us. COM401-MK Rebuild Kit Including.. These repair/rebuild kits include all you need to restore or repair your Stratus piston air compressors. Please ensure you choose the correct kit for your model number. If you are unsure please contact us. ..